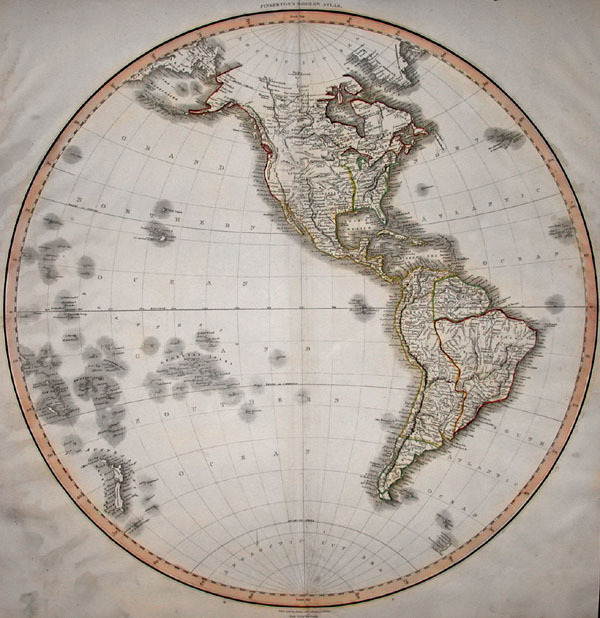 This hand colored map is a steel plate engraving, dating to 1814 by the important English mapmaker Pinkerton. It is a representation of the Americas, North and South, from the perspective of the Western Hemisphere. This map is extremely detailed and beautifully hand colored. When it was made, the United States extended no further west than the Mississippi River. The remainder of North America is shown divided between French, Spanish and English powers. Includes all of Polynesia, as well as the Azores. Pinkerton maps are known for their stunning color, awe inspiring size, and magnificent detail. Pinkerton's work, including this map, represents some of the finest cartographic art of the 19th century. Map is in good condition. Center fold will iron out beautifully for framing. Political boundaries as well as major states, territories, and counties are carefully labeled. All major cities, bodies of water, rivers, mountains, islands, and sub regions are also labeled and defined in vivid full color.